Say you had a particularly stressful day at work and you came home and finished off a bag of chips before dinner instead of snacking on something more nutritious. Or maybe you fully intended to go to the gym before work, but your bed was just too darn comfy. Or perhaps you had planned to stick to the vegetables and lean protein offered at that dinner party, but those buttered dinner rolls were calling your name. So you give in to temptation. And you immediately feel crappy about your decision. But then you think, I shouldn’t feel this way. Tomorrow is a new day. It’s just a bag of chips; I can start again tomorrow, right? I feel guilty, but I feel silly for getting upset over something like this because I read this post on Facebook/inspirational quote on Pinterest telling me not to feel that way, that I shouldn’t beat myself up over things like this, and now I feel bad for feeling bad. Sounds like a vicious cycle, right? Unhappy with your body? Change your perception by thinking of it like this. At the right place at the right time for this rainbow in Maui. Are you unhappy with the way your body looks? Do you pick yourself apart, thinking negative thoughts about how this part of your flesh looks in that particular outfit, or the way that body part of yours should be just a little bit more narrow/wide/tall? If you’re critical of your body, try thinking about it in this way. Try thinking of it as a rainbow. I was tagged by the lovely Rachel of bettylivin.com to answer a questionnaire that’s been floating around the health and wellness blogosphere recently. It feels like a Facebook note circa 2009! First off, I’m not one of those people who believes you have to eat healthy 100% of the time. I eat chocolate everyday, drink wine when I feel like it, go out for burgers and beers occasionally. But like all things bad for you, I consume them in moderation. Moderation means 10 less kilometres I have to run and three less sets I need to rep out to keep my body looking like it does and to be healthy, inside and out. I don’t know at what point in time our culture stopped supporting this. I feel like there is this weird cultural norm where you get judged when you slip too far towards either edge of the health spectrum — too gluttonous and people think you have no self control/self respect, too health conscious and people think you’re no fun/judging everyone else/annoying. The perfect balance would be eating what everyone else is and still looking healthy, which isn’t possible except for those people gifted with genes that let them eat whatever they want and not gain a pound. 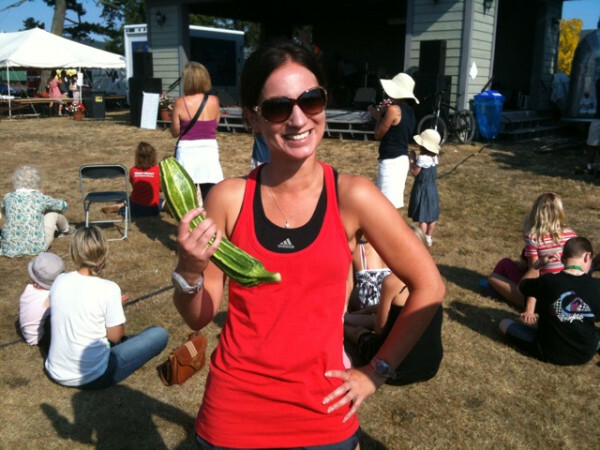 I think I did everything you aren’t supposed to do before a 21.1k race. I hardly ran in the weeks leading up to it. I went on a 18 km hike the week before followed by a 19.22 km run the next day “just to see if I could do it.” I did strength training the day before ’cause I felt like it. I drank beer the night before the race, also ’cause I felt like it. I didn’t stretch. I didn’t eat my go-to pre-race breakfast. And I waited until the very last minute to register. 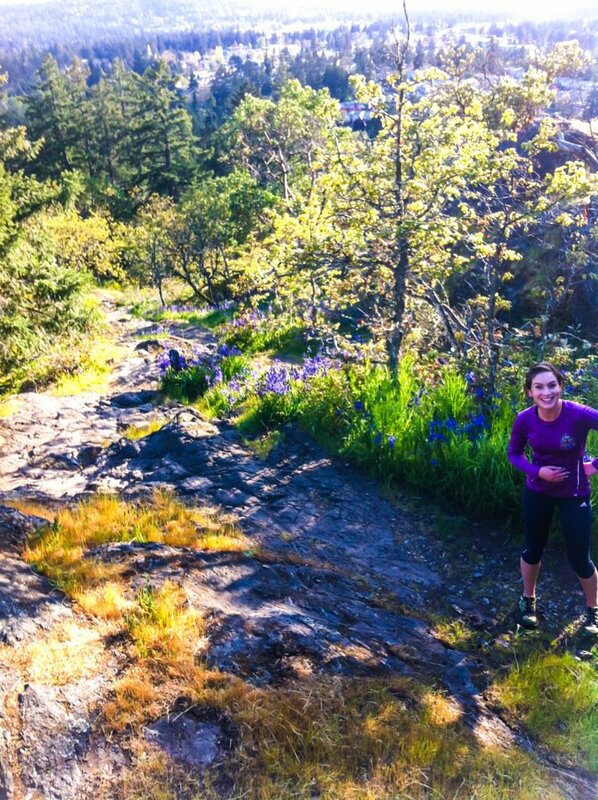 On a Mill Hill trail run with running buddy Debbie… clearly out of shape. 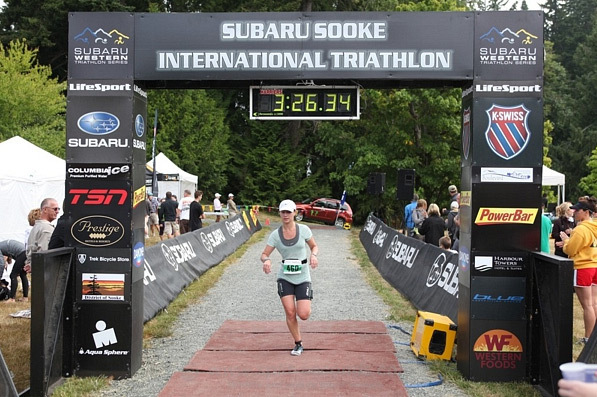 Me finishing the Sooke Tri last year! So I have a super awesome exciting announcement to share with all of you! I was recently given the opportunity to combine everything I’m passionate about — writing, media relations, social media, triathlons and endurance sport events — into a career! As of Monday, I will be joining LifeSport Coaching as the Communications Coordinator for the Subaru Western Triathlon Series! 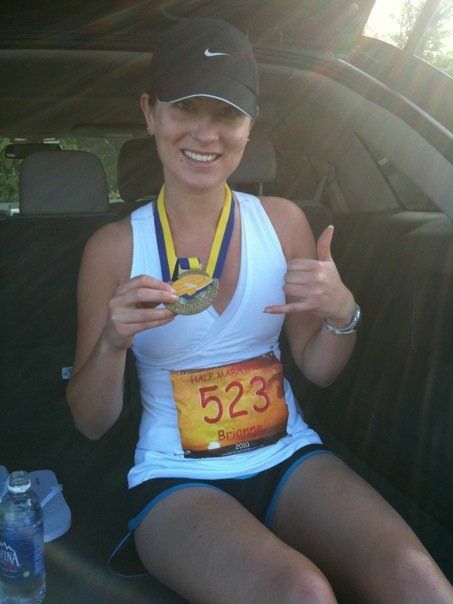 Me in Maui after finishing the Maui Oceanfront Half Marathon. Has nothing really to do with this post. I just thought it’d be more interesting than a stock photo of ‘Happy New Year’ text with squiggles and sparkles. I don’t usually make New Year’s resolutions. Mainly because I’m always thinking about, planning and refining my goals — personal, fitness and otherwise — throughout the year. But January 1st is a good time to reflect on the highs and lows of the previous year and how they changed you, as well as look forward to and plan what you want to achieve in the year to come. And by planning what you want to achieve, I don’t mean the lose-30-pounds-and-make-time-to-read-more-books type of plan (otherwise known as the ‘New Year’s Resolution’) — I mean actually writing down your goals, and considering what it is you actually need to do to reach them. So I meant be more consistent with my blog posts throughout August and September, but it was hard to find time to blog in between road trips to the Okanagan, camping, barbeques, and other more social activities that kept me outside and away from the computer. Now that the typical west coast weather has returned to the island (sad face), I’ll probably get back to blogging weekly. “Looking good! Less than a kilometre to the finish line!” shouted a runner passing by me going the opposite way. A year ago today, that other runner was me, cheering on the last of the Self Transcendence triathlon participants finishing up the run portion around Elk Lake. 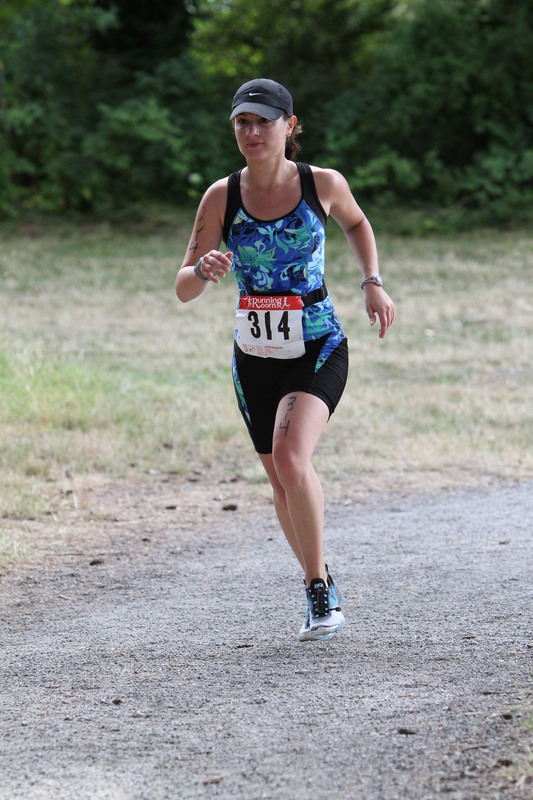 I was out for a long run at Elk Lake, my 2010 summer Sunday ritual as I geared up for my first full marathon that fall, when I decided I would do this very same race next year. I was inspired by those triathletes, and thought the event looked like fun. So what if I couldn’t swim? I have a year to train. I can do this. One year later, there I was, finishing up the last few kilometres of the 10 km run portion of an Olympic triathlon, with other runners cheering me on.